Compare prices on car hire in Lecce from all the major brands and find the best deals. When you book through us, unlimited mileage and insurance are always included in the price given. 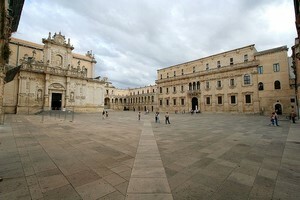 Lecce is the capital of the province of Lecce and belongs to the region Apulia. The city is centrally located on Italy’s protruding heel in the south and the number of inhabitants is around 95 000 (2009).Adriatic Sea is looking to the east of this part of the country called the Salento and the Ionian Sea is located nearly 70 km further south of the city. Lecce is located approx. 10 km inland from the Adriatic coast. Casale Airport is located nearly 50 km south of Lecce.